Bulldogs look grumpy. However, ask anyone who owns one and grumpy is one of the last things you would call them. They may be short, stocky dogs and have a fairly mean look, but they are sweet, playful and loving. The Old English Bulldogs were originally bred to fight bulls (bullbaiting) and over the years, dogs that were used for this developed stocky bodies, large heads and jaws as well as a ferocious and savage temperament. However, once the Cruelty to Animals Act 1835 was introduced it became illegal and the Bulldogs were no longer useful. Years later the original Old English Bulldog was crossed with a pug which made them shorter and wider with a brachycephalic skull. It also resulted in a much friendlier and less aggressive dog that made for a loyal companion and great choice as a family pet. Bulldogs may look intimidating but they are loyal, gentle and tolerant dogs which makes them a great family pet. They are not really ideal for first time dog owners due to the fact they can be stubborn and determined. Unless you are able to show them you’re the boss they can walk all over you and it will be difficult to train them. When it comes to training they respond well to voice commands. However, if you shout at them or sound harsh they can suddenly develop selective hearing. They will be more likely to walk off and leave you to it. Bulldogs love people and hate being on their own. 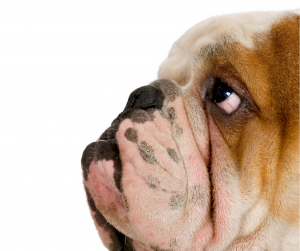 If Bulldogs are left for long periods, they could develop destructive behavioural problems. Another trait of a Bulldog is the snoring. They are one of the worst snorers in the canine world. If you get a Bulldog, you might want to invest in some earplugs. 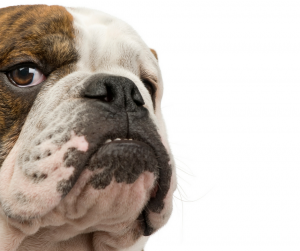 Bulldogs have short muzzles and a fairly flat face which makes them a brachycephalic breed (read our blog HERE). Because of this, owners will need to be careful when it comes to exercising their Bulldog especially in the summer months. If they are over excited or over heat it can cause breathing problems. Also, they are more susceptible to heat stroke as they are not able to cool themselves down efficiently through panting. Breathing difficulties (due to their elongated soft – palate which can block the airways. Cleaning a Bulldog’s face is something that should be done daily. The folds in the skin can collect dirt and moisture which can lead to infections. It’s best to use a damp cloth then towel dry the folds. They have short coats so grooming them once a week will be sufficient. Overall, if you can put the time and effort into training and caring for a Bulldog you will have a pet that will bring you many years of joy. As always, if you have any questions regarding your pet’s health feel free to call us at the clinic or leave a question on our Facebook page. Next PostNext Why do dogs eat poo?